First, let me say that, yes, the US is one of the richest countries on earth. While the per-capita comparisons at this link don't account for how many hours we work (which is a lot), it does still show the US as richer than most developed countries (though our middle class is no longer the world's richest). And, of course, the US has many amazing attributes besides its wealth. But, I'm not sure we've been cognizant of important advances happening around the world. Sure, the US is rich, but if that wealth doesn't lead to healthier, longer lives, then perhaps something is amiss? 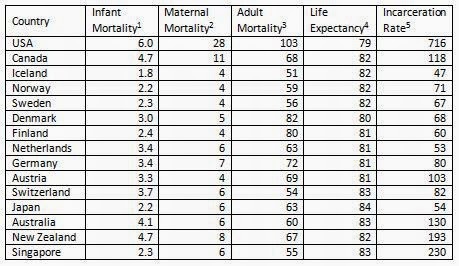 Notice that adult mortality, or one's chance of dying between the ages of 15-60, is twice as high in the US as it is in Iceland, and notably higher in the US than in every other rich country in our sample. Maternal mortality has been in the news of late, and indeed, it appears that US mothers are seven times more likely to die due to the effects of childbirth than is the case in Iceland, Norway, Sweden, Finland, and Austria. Separately, and I'm not sure how many people followed this at the time, but remember when Singapore caned a US citizen (yes, caned) for theft and vandalism? Well, interestingly, Singapore has one third the incarceration rate of the US. Weird, right? What's weirder is that the US imprisons people at thirteen times the rate of Japan, the Netherlands, or Iceland. Oh, and children in the US are twice as likely to die before age one than are the children of Iceland, Norway, Sweden, Denmark, Finland, Japan, and Singapore. Shouldn't US politicians make an issue out of this so we can, like, catch up, or something? If anyone out there is really feeling good about the US right now and has data showing us as being awesome at various things, I'd love to see it. It'd be good for morale. 1. Probability of dying between birth and age 1 per 1000 live births in 2012. Data here. 2. Maternal mortality rate per 100,000 live births in 2013. Data here. 3. Probability of dying between 15 and 60 years of age per 1000 population for 2012. Data here. 4. Life expectancy at birth (in years). Data here. 5. Prisoners per 100,000 population. Data here. SLC has direct international flights to where?